You don’t have to be a professional designer to mock up websites. That’s because mock ups aren’t about design. They’re about communicating your ideas and gathering the feedback that will make the biggest impact. Polish and the flashy colors aren’t what we’re looking for. We want great ideas. With this in mind, screenshots offer a quick and easy way to create successful mock ups and communicate your ideas. Below I’ll walk you through how to do this using my favorite screen capture tool, Snagit. If you don’t have it, you can download a free trial. Don’t start from scratch. There are already a lot of great examples floating around the web and if you look hard enough, you likely can find one that’s similar to the design you’re trying to create. When you find the right example, capture the entire thing. Don’t worry if it doesn’t match perfectly, as we’ll add to the design and customize it later. If you’re not certain how to capture an entire webpage, including the parts that require scrolling, check out our Scrolling Capture tutorial. Next, find other pages you like and capture the parts of the mockup that the original capture didn’t include. For example, I’d like to have an email sign-up for a monthly newsletter and a login option that’s part of the top navigation bar. Keep in mind that you shouldn’t worry about things like colors and fonts at this point. Focus on finding concrete examples of the ideas and functionality you want to create. When making a capture, select exactly what you need with the Snagit crosshairs, then use the magnifying glass to perfect the capture. If you capture too much or want to make changes to your capture, use Snagit’s editing tools. For example, use the selection tool to remove extra objects and automatically fill in the background to make it look like the objects were never there. Or, use crop to refine the size and shape of your capture. With all of the parts for your mockup captured, bring them together in the Snagit editor. Start by selecting the initial full page capture. Then, drag and drop captures from the Recent Captures Tray directly on top of the full page capture. From there, you can click and drag to rearrange the captures and position them to fit your desired layout. When you’re comfortable with your layout, it’s time to customize the design. Start by right clicking on your mock up and choosing “Flatten All.” This combines all the images into one, which will make it easier to edit the finer details. Next select the move tool and choose the “Smart Move” option to magically make everything editable (it’s not actually magic, it uses OCR technologies). With Smart Move enabled, you can remove extra objects, change the text and adjust the position of just about anything. To add those finishing touches, use the Paint Bucket tool to match colors, the Text tool to add text and the Shape tool to complete any design ideas. To learn more about editing in Snagit, check out these tutorials. With your mock up finished it’s time for feedback. Use the share outputs to quickly send your mock up to a colleague. 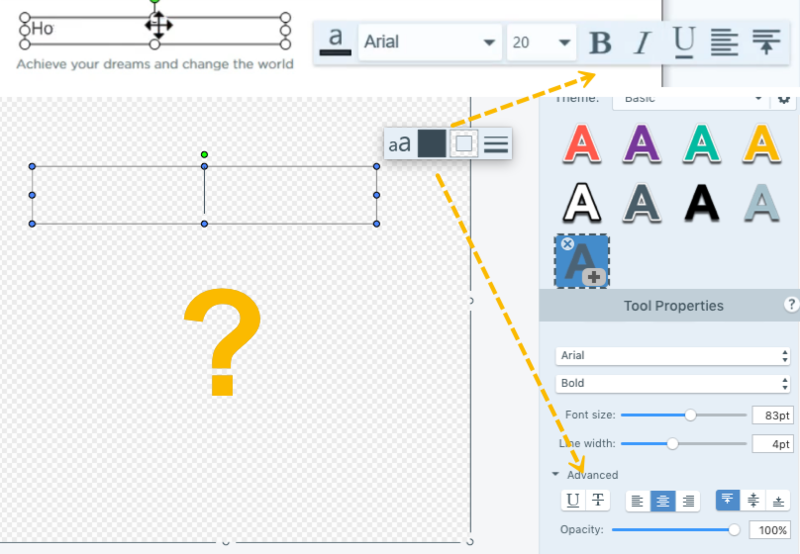 If the person also has Snagit, they can quickly add callouts, arrows and use Smart Move to provide their feedback. Screenshots are great for website mock ups, but they work for other types of mock ups, too, including software user interfaces. If you have any questions or comments, feel free to leave them below. I’ve used SnagIt for over 10 years and only recently noticed that the zoomed up cross-hairs can be adjusted pixel by pixel using the arrow buttons! This feature is perfect for us detail-oriented guys. Timing on this article could not be better – changing the launch page of our LMS. These strategies will increase the clarity of design to the webmaster. Thank you! So glad to hear you found it useful, Meg! I use the Selection to move sections but the background of the removed section doesn’t fill with the background of the area around it. What am I missing? Tell your “Powers That Be” that the editor needs a default “Pointer” that clears any selection that has been made. This editor is the only one that I use that doesn’t have such a feature—and it would be trivial to add. Just a simple “Clear Selection” icon. For example, I create an arrow and then accidently move over the image and click and I get another arrow. I can’t “shake” the arrow tool. I click on Fill and can’t clear it. Very frustrating. Thank you very much, we appreciate the feedback! Screenshot from your demo with my reality below it. Have an explanation? Starting with this Blog notice that I received in my Outlook box the embedded pictures don’t display. All previous ones displayed correctly. Very sorry to hear about your issue. What is displaying instead? Very sorry to hear about this! When you say demo, do you mean trial version? Is this happening from a mobile device? No. It’s on an HP Touchscreen computer. The Blog email that I received today, displayed the embedded picture correctly. Two quick questions: Did you add any content before creating the screenshot, and what did you do to prompt this demo to begin? Hello can these things being done in the Snagit editor also be done in Camtasia, or is it necessary to own both apps? Ditto – The only way I’ve found to shake off inserting objects after I started is to click the selection icon. It seems the older version of SnagIt had a pointer icon that we clicked that stopped inserting stuff. Here is my biggest frustration. I have been developing software for over 50 YEARS! What I am asking it a TRIVIAL change; probably a good few hours, including testing. It’s what we used to call a “No Brainer.” I don’t know why they don’t just do it. I think they may have gotten too big, meaning bureaucratic. You’ve got me beat – I’ve only been developing software for 35 years. My next biggest complaint is when they handicapped color selection. SnagIt used to have full color selection, now we’re stuck with a small selection of off-colors. I like using SnagIt for documenting my software but the newer releases of the editor are going backwards, replacing tools with toys. I can’t match colors of the things I’m documenting with the small pastel color pallet. I find myself using other tools more often which makes me sad. Do you suppose they use Snagit themselves? Or have they ever used any other graphics packages? I continue to be puzzled by your responses. 1/ Your demo above plays automatically. 2/ Obviously I added content: a question mark and arrows. Yes, so is there an issue you’re having with it? Unbelievable. I’ve stumbled into the Twilight Zone here. Either you’re bonehead stupid, or you’re just messing with me. Either way, I’m done. The email I received today displayed Red X’s instead of the embedded pictures. me tooo!!! it can be very frustrating. Glad to know i’m not alone.